Efforts to raise funds for flood relief have been implemented via the community’s online membership program with other groups and individuals taking their own initiatives. DNA India reports on one of these by youngsters on the Eid ul-Adha festival. This year’s Bakra Eid celebrations had more than the usual greetings and celebratory delicacies. Members of the Dawoodi Bohra community made sure that keeping the spirit of Eid alive, they lend a helping hand to Kerala flood victims. 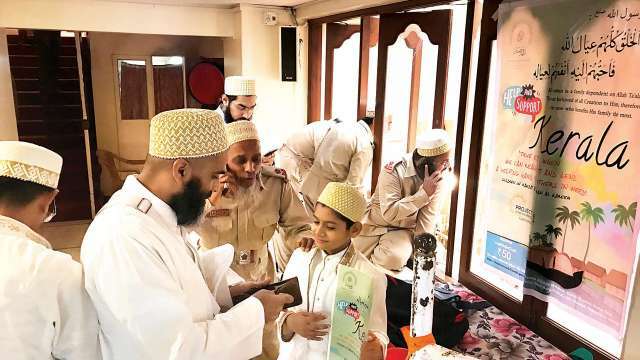 The Dawoodi Bohra community which celebrated the Bakra Eid on Tuesday — most other sects will be celebrating it today — had set up various centres for members of the community to raise funds. Over 17 centres were set up around the city where largely children outside mosques asked people to donate money for Kerala flood victims. “The idea is to help people in need, it is our civic duty. Since Eid is an auspicious time for charity, we felt that we should make sure that we make some contribution,” said Ammar Tyebkhan coordinator of ‘Project Rise’ which overlooked the raising of funds. The community were asked to contribute any amount more than Rs 50. “We did not say that if the amount is lower, it would be returned. We felt that Rs 50 by each member is a decent figure,” said Tyebkhan of the drive that is likely to go on for a few days. While Bohras were raising funds at the community level, some did it at an individual level. “Every year I sacrifice four goats. This year I took only three goats, and the money saved was given for flood victims,” said Zubair Azmi.